The 20th Century History lecturer is a professor of 20th Century History at Mars University. 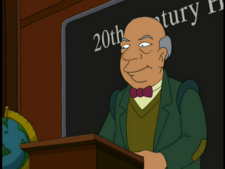 He teaches a class that contains Fry, Amy, and Guenter, assuring them that the only way to get an A is to have actually lived in the 20th century. He does not hesitate to electrocute students when they say or do something wrong. The character appears to owe something to Prof. Charles W. Kingsfield Jr., John Houseman's character in The Paper Chase, set in Harvard, the Mars University of Earth. He resembles Professor Morris Katz. This is probably a coincidence, as they both seem to be inspired by John Houseman in The Paper Chase, and Morris was introduced in "That Darn Katz! ", which aired almost 11 years after "Mars University", the lecturer's first appearance. This page was last edited on 29 April 2015, at 15:38.